Marvel at dramatic landscapes, otherworldly geological formations and charming rural villages on our 8-day Iceland summertime getaway. If outdoor adventure is at the top of your list, Iceland is the right place. This beautiful country is brimming with contrasts: fire meets ice, rugged mountains meet cascading waterfalls, and isolated people radiate vibrant culture. During the summer months, we benefit from birds and marine animals making their return to the coast, as well as long, sunny days, excellent temperatures and perfectly blue skies. This stunning North Atlantic island is the perfect place for a summer adventure. We begin and end our trip in lively Reykjavik, Iceland’s coastal capital. Hike amid magnificent landscapes, enjoying national parks filled with obsidian fields, blue lakes and volcanoes. Explore tremendous waterfalls fed by glaciers, vast icecaps and bubbling hot springs. Spend a full day hiking in Vatnajökull National Park—a jumble of rugged peaks, massive glaciers and iceberg-filled lakes spanning almost 600 square miles. Our evenings are spent nestled comfortably in a cozy hotel, enjoying authentic meals in the company of fellow travelers. Considering visiting Iceland during the winter months? Check out our Iceland Winter Adventure trip to see the quiet beauty of Iceland during the other part of the year. Double-occupancy hotel accommodations with private baths for 5 nights; double-occupancy camping accommodations for 2 nights; all meals from breakfast on Day 1 through breakfast on Day 8; English speaking guide(s); one group transfer from Keflavik Airport on Day 1; transportation within Iceland; group camping gear including tents and sleeping bags; entrance fees to all national parks; entrance fee for hot springs on Day 6. Marvel at the waterfalls at the foot of the Eyjafjallajokul volcano. Our trip begins in Reykjavik, Iceland, this morning. Our guide will meet flights arriving into Keflavik airport between 6am and 7am. After breakfast and an orientation in Reykjavik, we drive to 200-foot-tall Skogafoss waterfall—one of the island's prettiest cascades. Skogafoss is the last and most dramatic of the approximately forty waterfalls fed by the Eyjafjallajokull Glacier. Here we'll enjoy a short hike along Skoga River, encountering over twenty waterfalls of various shapes and sizes. This area lies at the foothills of the Eyjafjallajokul volcano, and was completely covered in ash following the 2010 eruption—a stark contrast to the lush green vegetation of today. This afternoon we continue to our lodging in the beautiful and mountainous region of Skaftafell. All meals included. Hiking: 5 miles (3 hours); Terrain: Rocky trails, dirt paths, and stairs; Elevation gain/loss: 958'; Driving: 5 hours. Summit hike in the Skaftafell region of Vatnajokull National Park. A full day of hiking today in Skaftafell region of Vatnajökull National Park—a jumble of rugged peaks, massive glaciers and iceberg-filled lakes spanning almost 600 square miles and offering a myriad of trails for the hiking enthusiast. The park encompasses part of the great Vatnajokul icecap—the world's largest icecap outside of the Polar Regions. We explore Skaftafellsheidi Heath, with views of the Skaftafellsjökull Glacier on one side and the Morsárdalur Valley, decorated with colorful rhyolite mountains, on the other. In the bottom of the valley, huge blocks of ice lie scattered after falling from cliffs. Weather permitting, we climb up Kristínartindar (3,500'), which gives us unparalleled views of the surrounding glaciers and peaks including Hvannadalshnukur, Iceland's highest mountain (6,950'). Late in the afternoon we return to our hotel for a shower before heading out to Jokulsarlon Glacial Lagoon. The lagoon is home to house-sized icebergs deposited in the water by the nearby Breidamerkurjokull Glacier. All meals included. Hiking: 11 miles (9 hours); Terrain: Rough trail with steep scree hill, some exposure near the summit of Kristínartindar; Elevation gain/loss: 3,773'; Driving: 2 hours. Hike in Landmannalauger among rhyolite mountains and glacial lakes. We continue by vehicle between the giant icecaps of Vatnajokull and Myrdalsjokull, en route to the gorge of Eldgja (Fire Fissure). Another of Iceland’s incredible natural attractions, Eldgja is a 25-mile-long volcanic rift formed during a 10th-century vocanic eruption. It produced the greatest amount of lava ever recorded. We hike into the rift and visit Ofaerufoss waterfall. Continuing west toward the volcanic region of Landmannalauger, we enter the Fjallabak Nature Reserve. Its surface is covered with pitch-black lava and pumice stone. We stop in Landmannalauger and set out on a hike to the top of a nearby peak for a panoramic view of this remote highland oasis surrounded by vividly-colored rhyolite mountains, fissures, glacial lakes and obsidian lava. Back in our vehicle, we travel along backcountry dirt roads that grant the only access to the Fjallabak. Tonight’s hotel is located near Mt. Hekla, one of Iceland’s most active volcanoes. All meals included. Hiking: 7.5 miles (4 hours); Terrain: Rough dirt, lava and rocky trails; Elevation gain/loss: 1463'; Driving: 5 hours. Pass famous Eyjafjallajokull Volcano. Camp comfortably in birch forest. We spend the next two days hiking in the amazing Thorsmork region (named after the pagan god Thor). One of Iceland’s jewels, Thorsmork is surrounded by mountains and glaciers. It is only accessible via specially-equipped four-wheel-drive vehicles that can easily cross the glacial rivers encountered en route. We’ll have one of these vehicles at our disposal for our ride along the foothills of the Eyjafjallajokull Volcano and past the outlet glacier where the flood from the recent eruption rolled down. Our destination for the night is a remote campsite named Godaland, located in a sheltered birch forest. All camping gear including comfortable tents, sleeping bags and sleeping pads are provided and our guides will prepare hearty meals for us throughout our stay in this marvelously serene spot. All meals included. Hiking: 4 miles (3 hours); Terrain: Easy dirt paths and rocky trails; Elevation gain/loss: 300'; Driving: 3.5 hours. Hike new volcanic craters formed in Eyjafjallajokull's 2010 eruption. The Thorsmork Valley is full of geological wonders and dramatic scenery that has been enjoyed by Icelandic nature lovers for many decades. We spend the entire day hiking directly from camp to the new volcanic craters, Magni and Móði, formed during Eyjafjallajokull’s 2010 eruption. As we gain elevation during our hike, the terrain changes dramatically. We find ourselves crossing a large, fresh lava field; an unmistakable reminder of what lies beneath the now tranquil surface of this ever-changing landscape. At day’s end, we return to our familiar campsite in Godaland and enjoy another peaceful night in the Icelandic backcountry. All meals included. Hiking: 10 miles (8 hours); Terrain: Dirt and rock trails, lava fields, steep hills, scree, possible snow, some exposed sections; Elevation gain/loss: 2,788'. Hike Mount Hrafnabjörg and relax in the Fontana Geothermal Baths. We drive to Friðheimar to visit a greenhouse that uses geothermal heating to grow tomatoes. Following a tour of the greenhouse, we’ll enjoy a lunch of freshly made tomato soup, surrounded by fragrant tomato plants. Afterward we transfer to the start of our hike in Þjófahraun lava field. During the last glacial period, there was widespread volcanic activity under the ice which formed palagonite mountains and ridges. Mount Hrafnabjörg is one of them, and we’ll hike to the summit for amazing views (weather permitting). To the west we have Lake Thingvellir and the rift valley. To the north we have Langjokull Glacier and Skjaldbreið Volcano. To the east we have palagonite ridges and to the south we see over moors, farmland and down to the ocean. After our hike, we head for the small settlement of Laugarvatn to relax in the Fontana Geothermal Baths. Later we head for our hotel in Hveragerdi. Hiking: 4 miles (3 hours); Terrain: Rough dirt and rock trails; Elevation gain/loss: 1033’; Driving: 4 hours. Hike to the summit of Mount Hengill for outstanding views. We'll spend the day hiking in the hills around Mount Hengill and possibly have an opportunity to walk up the mountain itself. This area is unique for its geothermal activity and during our hike we'll encounter lava fields, hot springs and unusual geological formations. The summit of Hengill, Skeggi, offers outstanding views and our goal will be to reach the top. In midafternoon, we'll climb back aboard our vehicle and proceed to our hotel in central Reykjavik. Reykjavik, the world's northernmost capital, is filled with brightly-painted buildings, numerous parks, a wide variety of cultural attractions and a vibrant nightlife. A celebration dinner is planned for this evening in a downtown café. We’ll relax, exchange memories and enjoy the company of newfound friends. All meals included. Hiking: 7 miles (5 hours); Terrain: Rough dirt and rock trails with hills; Elevation gain/loss: 2,362’. Our journey ends in Reykjavik. Following breakfast, your REI Adventures trip in Iceland concludes. Transfer on your own from our accommodations in Reykjavik to the international airport or continue your independent exploration of Iceland. Breakfast included. Air transportation; alcoholic beverages and soft drinks; optional guide gratuities; airport transfer on Day 8; insurance of any kind; laundry expenses and items of a personal nature. Southwestern Iceland's climate is strongly influenced by the warm Gulf Stream waters and prevailing southwesterly winds. While these forces act to moderate year-round temperatures, they also, in concert with Iceland's mountainous geography, produce extremely variable weather conditions across the island. Summer temperatures generally range from the mid to high 50s during the day, dropping into the high 40s-low 50s at night. While clear weather is not unusual during June, July and August, at least some rainfall is a strong possibility during any month. Participants must be prepared for weather extremes that vary greatly from region to region as we travel through the country. 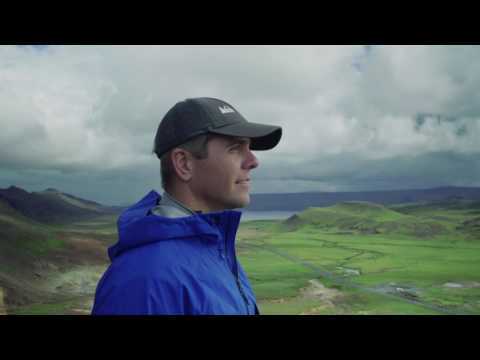 This nature enthusiast and artist from a small town in Iceland has been guiding trips since 1998. Kristján is a qualified mountaineer and is fond of the extreme environments found throughout Iceland. He enjoys sharing his country's beauty with guests. Pétur has been guiding in Iceland since 2001. He grew up in the Breidafjordur archipelago, which is famous for being Iceland's only marine conservation area. Pétur is an experienced hiker and nature enthusiast, and has trekked throughout Nepal and Africa. Our itinerary is unique as it allows us to get away from the crowds such as camping in a valley surrounded by rugged mountains and tumbling glaciers. Hike to volcanic craters and past thundering waterfalls.